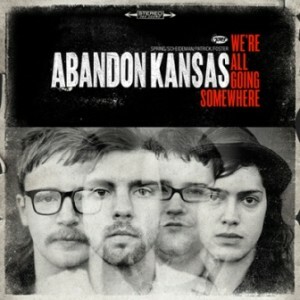 Abandon Kansas – We’re All Going Somewhere EP | NoCoda. What It Sounds Like: Alternative Indie Rock with vocals that sound like Jon Foreman from Switchfoot and some extra lead guitar work in the background. That’s it in a nutshell. Small town kids miss the city / city kids miss the trees Jeremy Spring gives us for a chorus over an even-tempo beat provided by his bandmates. I’m still questioning which category he falls into. City kid? Small town kid? These dudes are from Wichita, so my money is on the fact that they fall right in the center (my money is also on the nine seed Wichita State – it’s gonna happen!). Wichita is a city but – it certainly isn’t hard to find the small town trees around there either. We’re All Going Somewhere falls into this middle ground far too often, and like those kids, it can’t decide where exactly it wants to be. The tracks feel restrained, like Abandon Kansas is holding themselves back for something. Back for a big moment or experience that never seems to get there. The Harder They Fall kicks us off with with pretty decent energy – enough to certainly show promise – but it all starts to fade away from there. Tell me you love me / tell me you love me Jeremy wails throughout Make Believe. It doesn’t sound bad, but it doesn’t exactly stick to your bones either. We’re All Going Somewhere and Months And Years are simply middle-of-the-road alternative rock songs that I, regretfully, could take or leave. They simply fail to make any lasting impression on the listener. Go ahead, listen to them. Now that they’re over – is there anything about them that makes you want to go back for a second listen? It’s a shame. I can add to the mix that I was fortunate enough to see these guys live one time as openers for House of Heroes, and they actually put on a really good show. Above average, without a doubt. Brad Foster’s make-it-look-easy lead guitar work and his Michael Jackson-like dancing stole the show. Jeremy kept the crowd involved, and certainly exhibited a relaxed but energetic demeanor that made him an enjoyable front man. Live vocals? From what I remember, they weren’t bad one single bit. That’s what makes this EP so disappointing. It’s not a bad outing; its simply a middle-of-the-pack effort that has some good moments, but doesn’t do anything to set itself apart from the rest of the pack, or do anything to push it over the edge. Album closer Close Your Eyes finds Brad starting off with a lead guitar riff that sounds right at home in the kinda-dancy, kinda-alternative, kinda-indie spectrum. It’s catchy, and I recognize it when it comes on, but I’ve also heard this type of thing many times before. Not bad. Not good. Textbook definition of an EP from a great live band that is simply stalled out in the middle of the road.